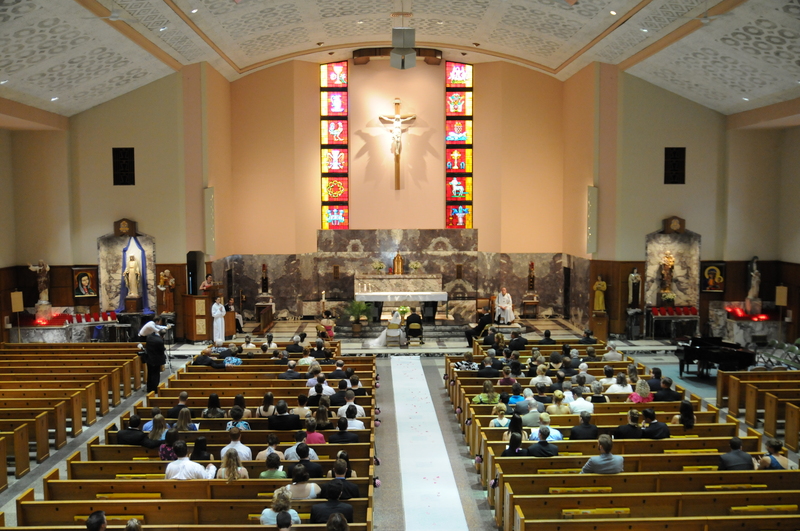 I got married in the same church where I was baptized and at the same parish where I went to grade school. It’s what you think of when you think of traditional Roman Catholic churches. When I started thinking about how to decorate such a large space, my priest gave me some advice. He told me that he’s seen it all – weddings with a ton of flowers and decorations, and weddings that had nothing. In such a big space, no matter what you do, there won’t be enough to make a huge difference. He is a wise man. He was totally right. The wedding party (especially the bridesmaids) add a ton of color to the altar. No matter how many floral arrangements I could have put up there with us, they wouldn’t have been noticed. I’m glad we politely said no thank you to the florist when they asked if we needed altar decoration arrangements. However, I knew the aisle needed something. 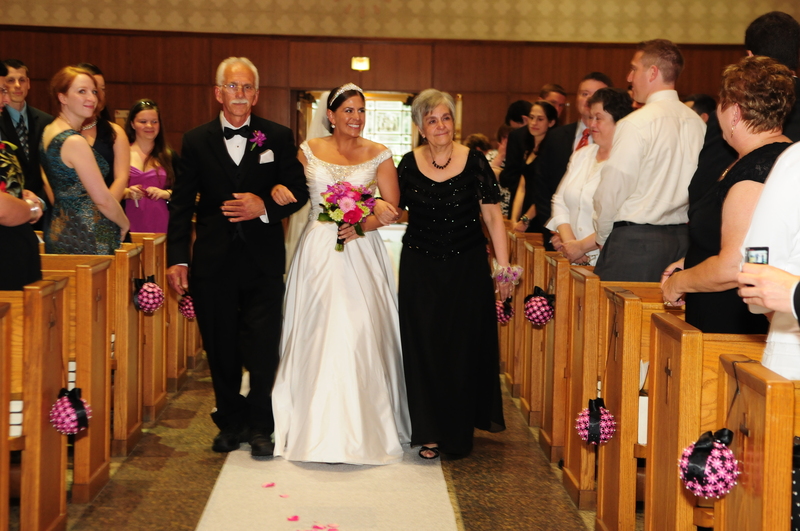 At 84 feet long, and with everyone looking down it, leaving the aisle undecorated was not an option. I knew flowers would be expensive, so I tried to figure something else out that would be economical, that would fit in with our flowers/theme, and would be pretty. That’s when I turned to pomanders. Originally, I tried to make them out of tissue paper. 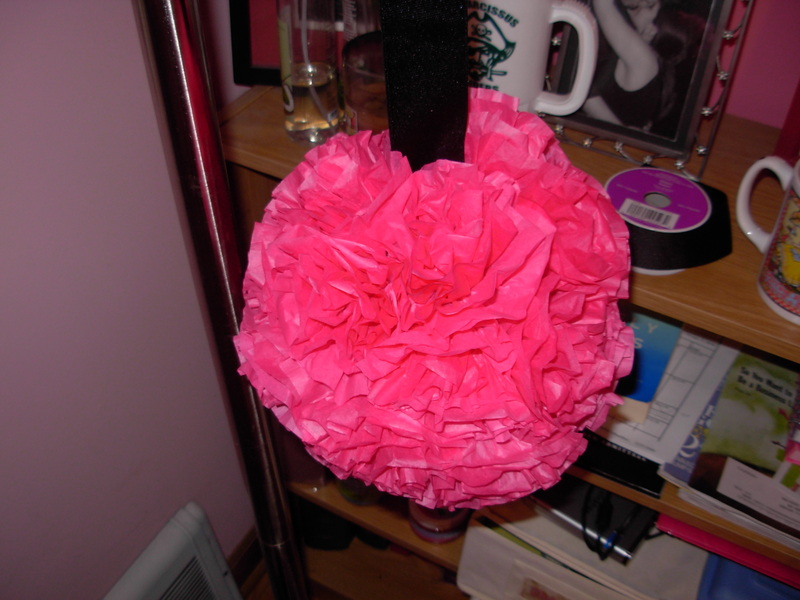 I took 3″ styrofoam balls, made tissue paper flowers, then used floral wire to attach the flower to the styrofoam. I made many flowers. It took a long time. 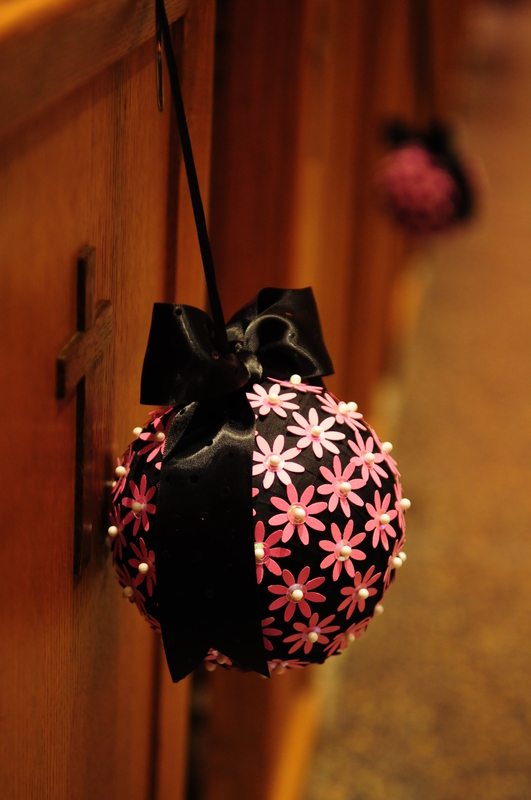 In order to make the pomander hang from the pew, I attached a thick black ribbon. Here’s what I got as an end result. I didn’t love it. It looked blah and very homemade. So I kept searching. I came upon this wedding blog post, and my eyes lit up. These were perfect! Pink daisies were already going to be in the bouquets, and I loved the clean and uniform look of the daisy punches. They seemed so easy to make too. I think I found my pew decorations. After a few trips to JoAnn Fabric for the seam binding and some hot pink scrapbook paper, three wonderful friends of mine and I got to work. 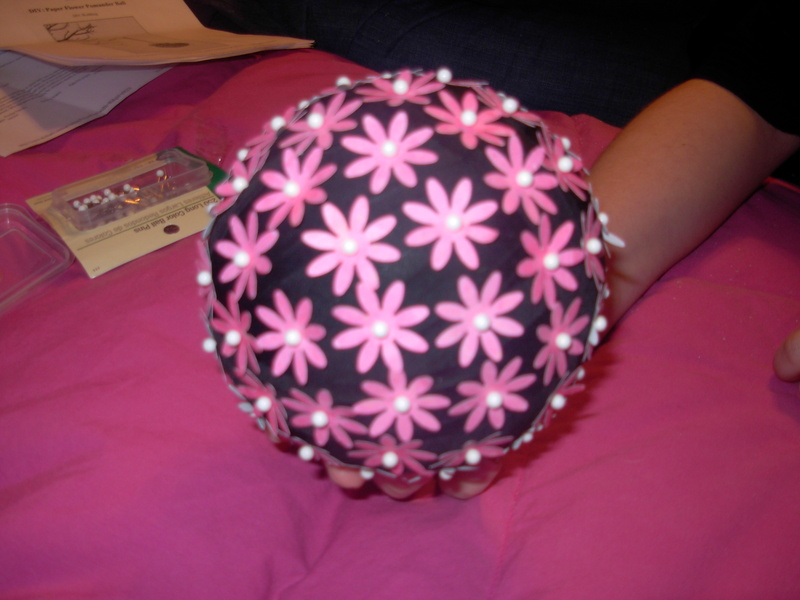 Becky, Claire, and Mary each began wrapping styrofoam balls with seam binding while I began punching out what felt like thousands of hot pink little daisies. 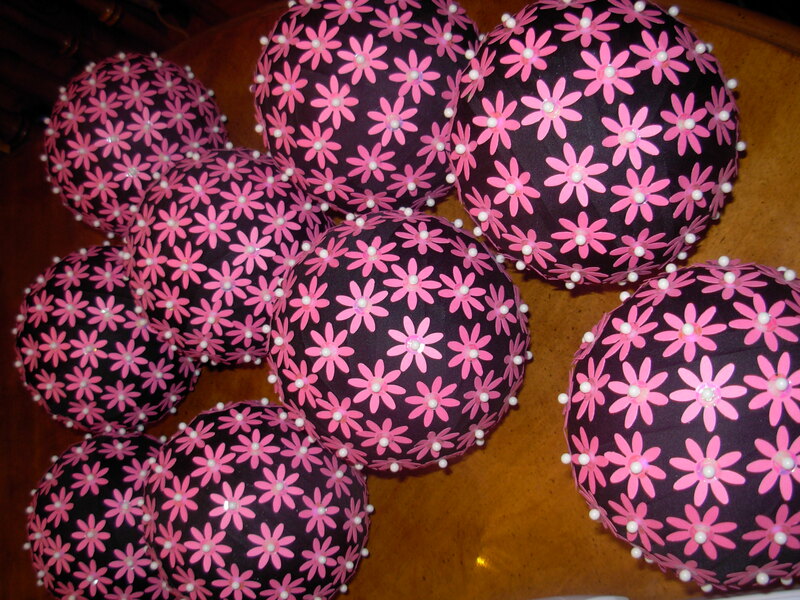 Once we had a few of the balls ready to go, I switched jobs and started pinning the flowers onto the now black styrofoam balls. We modified the pomanders from the blog post by adding a sequin to each flower. Just put the sequin on the pin first, then push the pin, sequin, and flower into the styrofoam. I love that extra little bit of shine. Hours later, we completed all 12 of the pomanders. The only thing left to do was to find a way to secure the pomander to each pew. At this point, it was 11pm and we were all tired. The solution would have to wait for another day. 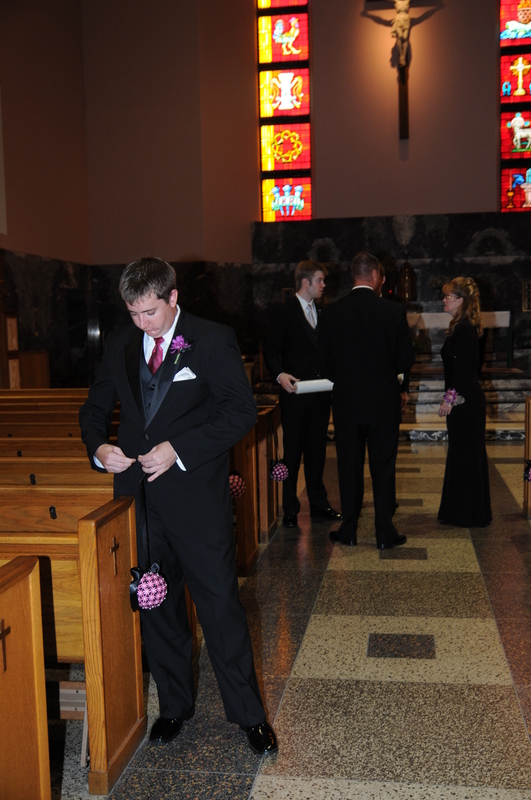 One of my bridesmaids, Becky, was my savior and volunteered to take all 12 pomanders home and solve the problem for me. I saw the finished product at the rehearsal. What an ingenious idea! She used over the door hooks! 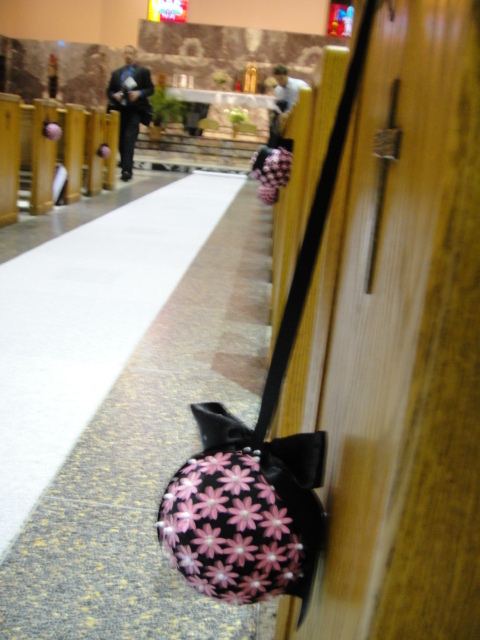 She cut each hook down and used the top part of it as the hanger for over the pew. She covered each hook with black ribbon and for added cute-ness, she bought black ribbon with sparkly dots to make bows. She’s quite the crafter. On the wedding day, they were hung on the pews with care by the groomsmen. Looking at photos later, I was beyond pleased with the results. Don’t tell anyone, but on wedding day, I didn’t even notice them. While walking down the aisle, I was looking at all my family and friends, and of course, at Dan, so I didn’t notice them as I passed them. But, they definitely added some pizazz to the long and boring aisle. And other people noticed. This was actually one of the wedding crafts I enjoyed making the most, probably because I made them with friends. Do you think I can make a living as a pomander maker? Maybe if I supplement my income by becoming a wedding planner too. Oh, and a cupcake shop baker. Dare to dream.